Improve the look of your kitchen by adding a stylish and durable Vigo faucet. Stainless steel finishes with matching soap dispenser all solid brass construction which ensures durability and longer life. Faucet features single function pull-out spray head with power spray. Includes a spray face that resists mineral buildup and is easy-to-clean. The Glacier Bay 3000 Series Drinking Water Kitchen Faucet in Stainless Steel has a convenient single-handle design that makes water control nearly effortless. 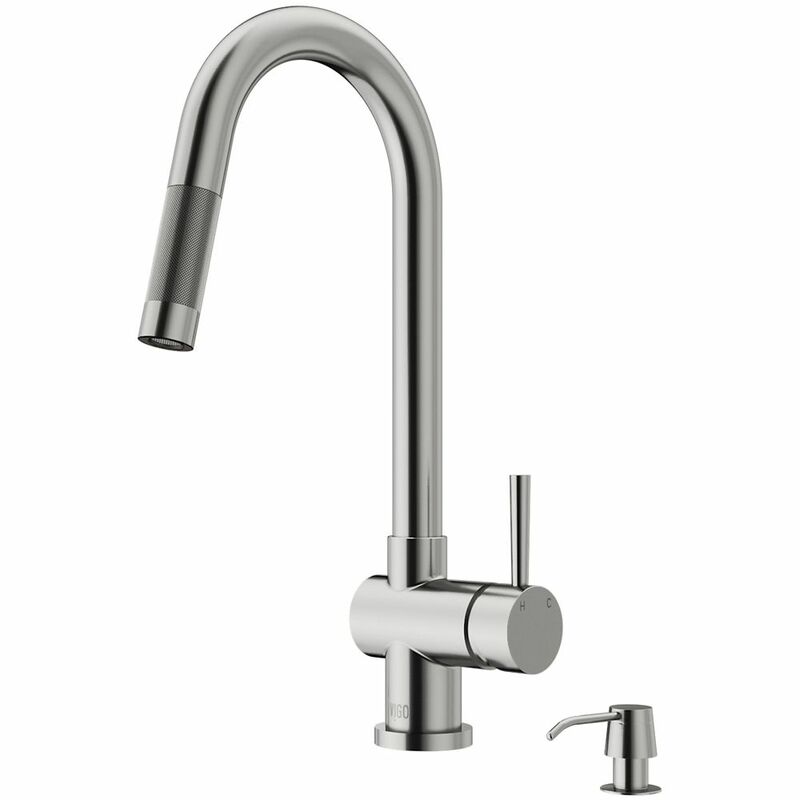 The faucet's stainless-steel finish gives it a sleek and sophisticated appearance. It's tall spout has a high arc that is ideal for pouring drinking water. Stainless Steel Pull-Out Kitchen Faucet with Soap Dispenser Improve the look of your kitchen by adding a stylish and durable Vigo faucet. Stainless steel finishes with matching soap dispenser all solid brass construction which ensures durability and longer life. Faucet features single function pull-out spray head with power spray. Includes a spray face that resists mineral buildup and is easy-to-clean. Stainless Steel Pull-Out Kitchen Faucet with Soap Dispenser is rated 4.4 out of 5 by 85. Rated 5 out of 5 by HomeDepotCustomer from It looks wonderful. Excellent quality. Great price.... It looks wonderful. Excellent quality. Great price. Rated 4 out of 5 by Karmenka from Fantastic quality Fantastic faucet - just wish the pull down had a sprayer function. It does not change stream and that’s the only negative. Otherwise it’s amazing and looks so sleek! Rated 4 out of 5 by RDJD from Very sleek and looks great Straight forward install and looks good. Only issue is the cartridge seems to leak a bit when u shut off the tap. I have taken it out and washed in warm water as suggested in trouble shooting. Can u send me a call replacement cartridge? Rated 3 out of 5 by Janine from Heavy duty but lacks spray nozzle I was so impressed with the quality of my daughter's Vigo faucet, so I ordered one for my home. I love the quality of this one, but it is missing a basic feature - a spray nozzle. The water pressure is decent, but now I need a scrub brush when I never needed one with the old leaky faucet.